So yesterday, I forgot to bring my shoes to Crossfit. 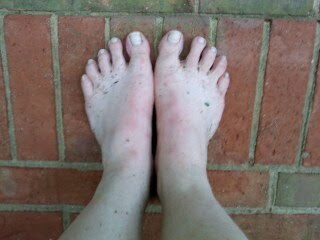 But it was ok, because we did barefoot running form practice! Someday, these feet will carry me for miles in all their bare pink glory. And we also had storytime! You guys remember Colin, right? The caveman-ninja with the pretty blue eyes? Yes? Well, for our warm-up, he had us all gather around him, then began to speak. This is, approximately, what he said. With a couple bits of color added by moi. Natch. "So we all just stayed there for a while, chillaxing amidst the primalness. And then I started - very slowly! - to crawl towards them. "And the deer flicked their ears and tails and looked up, but they didn't run, so I just kept crawling (as he did again) until I was about this far (indicating about 6 feet) from the fawn and about that far (15-ish feet) from the mother. (here we are all grinning like idiots at the imagining of the awesomeness overload that is being super-close to a fawn. a FAWN, you guys!!) And we all just sat there for a while until they left. Then I sounded my barbaric yawp and swung off through the trees, Tarzan-style. "So, guys, for your warm-up, you're going to crawl just like that." Dudes et al, this was insanely hard. The way I normally do bear crawls is basically a barely-controlled fall, sticking out my hands just in time to save myself from a nasty faceplant, then repeating the process. But here we're balancing on alternate hand and foot in a near-plank pose most of the time (or should be), so there's some intense core work going on here. It was incredible! Try it out! The idea was to fatigue us and still have us be able to control our bodies well enough not to kill ourselves on the hops. I still have to do little mini-hops in-between the big, over-the-bar ones just to catch my balance, but I'm working on that. We finished much earlier than he'd thought (I was at about 11 minutes, not pushing myself to the limit to avoid cramps), so we spent the rest of the time out back practicing running. I'll do a post solely on that at some point because it's pretty damn cool, and deserves its own space. Last Friday: a big ol' salad, with an egg, olives, part of an avocado and plenty of EVOO-heavy homemade dressing; stir-fried shrimp in more EVOO; and these are only some of the rasberries I had. 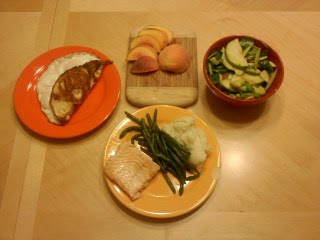 Last night: leftover salmon, green beans and mashed cauliflower; salad with caramelised onions, avocado, apples and homemade dressing; three eggs fried in butter; a delicious farmer's market peach. 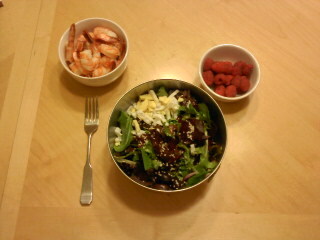 I think lately I'm enjoying my meals more than I ever have. I'm sure it's at least partly the demi-fasting I do during the day that makes all the flavors just burst on my tongue (as well as the fact that I use a TON of fat in my cooking now just to ensure that I'm getting enough calories for the day. mmm...fat...), but everything is just so incredibly delicious! I'm also starting to get my energy and mental facilities back after the intial training-my-body-off-grains period. You are doing the caveman diet! The famine-feast cycle is supposed to mimic how caveman could've eaten based on hunting patterns! But you probably already know that. Anywho, there's much to be said for big dinners! It's probably my biggest meal of the day and I do enjoy it! By the way, you are a fantastic writer! Why yes, I did know that! And it seemed very strange at first, especially after having it drilled into me that a lot of small low-fat meals is the way to up your metabolism and lose weight...but I absolutely LOVE it. I'm feeling better and healthier and more full of energy every day I keep on it. I'm so glad you're feeling good! I've never heard of this kind of diet...hmmm maybe I should give it a go. I need to change SOMETHING up. That is one funny story. I love how Colin used it as a lead in to a workout of torture. First make you laugh...then make you sweat. Thanks Joanne! I only just heard about it a couple months ago, and have been trying to stay on it for 3 weeks now. As long as I actually follow it (i.e. stay away from the cookie dough that is ALWAYS on hand at work >_<), I feel absolutely fantastic. Check out Mark's Daily Apple in my bloglist - that's where I get a lot of my information.